I’m thrilled to host author Daisy Banks today as she introduces her new book Marked for Magic (Lyrical Press/Kensington) and offers a bit of magic of her own with a posting on palmistry. I decided that as palmistry was the initial inspiration for this fantasy romance, I’d offer readers a little something on palmistry marks. 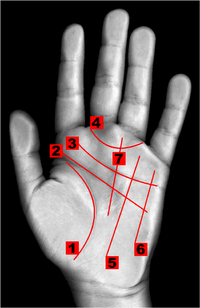 The image below shows you the main lines that can be found on a person’s palm. These main lines above are fairly well known, but the lesser lines are not quite so well understood and it was these I was studying when I got the idea for Marked for Magic. There is a mark some people have on their hand, a curved line at the base of their forefinger, the Jupiter finger. This unusual mark is called the ring of Solomon. People who have this rare marking are usually intelligent, philosophical, and tolerant. Did if you find this mark on your hand? By early evening, she’d only found twelve small seeing mushrooms. They rolled around in the bottom of the collecting basket. Her feet ached, for in her search she’d walked farther and farther into the darkened shadowy spaces. Worse than sore feet, though, she stared to find her way through the trees until her eyes burned and stung. She had no clue how to get back to the tower. She recognized nothing here through the welter of close-knit leaves. Maybe he wanted the wolves to eat her. She’d be a nuisance to no one then. How could he be so mean? She huddled down at the base of a large ash tree where she ran her fingers over a blade of grass so it squeaked. How would she find his tower before dark? Her empty stomach rumbled. Anger that he’d sent her out here evaporated with the need to find him again. There was no one else who could help her. The twilight shadows grew deeper, wrapping the woods in their embrace. Tiredness blurred her vision. Even if she hadn’t been lost, she’d have been afraid to go back without all the mushrooms he wanted. The sun sank lower. The first white stars shone in the deepening night-shaded sky. She curled up, wrapped her arms around the basket, and waited for death. By moonrise, still the wolves hadn’t come, but her fear continued to grow. Her breath shallow, she darted her glance to the trees, to the dark shadows between them, and back again. If only he would come to find her, she would do anything, she’d be so grateful. A leaf brushed her cheek, so she looked up as she moved it away. If she climbed the ash tree, perhaps light from the tower might lead her back. Hope warmed her. She swung up onto the lowest branch of the tall tree, gave the next bough a tug to make sure it would take her weight, then clambered up where she clung tight. The morsel of hope grew as she searched in all directions, but it withered when she saw only more branches and leaves. She grasped the next branch above. Relief slid over her. Though he didn’t sound pleased, the Mage had come to find her. She swung down onto the first branch, but caught her lip at his frown. He reached up to yank her down into his arms. “Hmm, did you? And my mushrooms?” He still held her. His mouth twitched in a half smile. To her surprise, he didn’t put her down, but strolled over, bent with her in his arms, picked the basket up, and hooked it onto his elbow. His brow wrinkled in obvious displeasure as the little mushrooms rolled around. She closed her eyes, praying they would double or treble in number. Sadly, they didn’t. She hoped he’d not beat her hard. Another great excerpt from an enchanting book, Daisy! I love how easily you immerse me in the scenes! Thanks for stopping by, Mae, and I completely agree with your comment! Thanks so much for commenting, Mae and what a lovely thing to say. Truly I you made me smile. A great cover and lovely excerpt. It shows the author’s skill in crafting worlds with her words. I also find the title absolutely fascinating. Best of luck with finding new fans, Daisy! Thank you Erin for introducing to your followers this talented author and blogger! So glad you enjoyed the posting–it’s always fun to discover new authors! Thanks so much for commenting, Carmen, and for your kind words.